Tristan turned 20 years old this spring. He spent the first 4 years of his life wild, and the next year in a government holding pen. 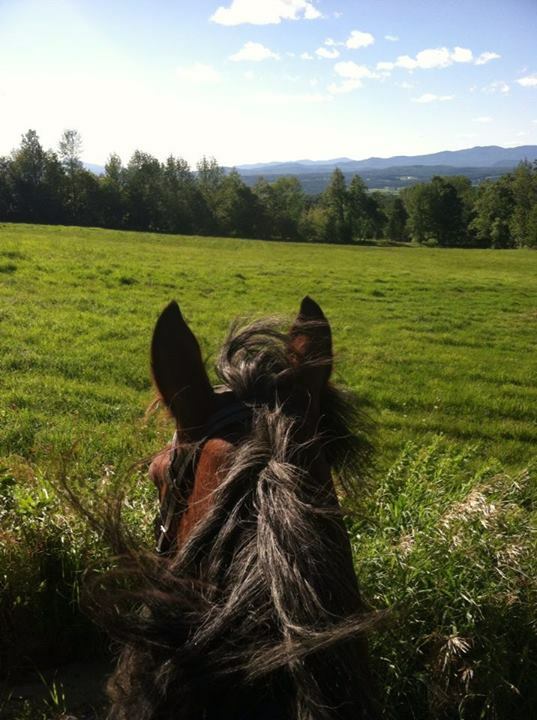 The four years after that were in his first adopter’s home, from which he was seized twice for abuse and neglect after several other horses on the property died. The second time was permanent. He then spent a year and a half at a rescue, and then he became mine. I’ve had him for almost ten years now, almost as long as he had on his own. I give you that background to say that he has had a relatively tumultuous and varied life, and also that only half of it was spent with positive human interaction. It feels like in the last year or two, his physical problems are starting to cascade. Nothing bad, but for the first five years I owned him I think I had two emergency vet calls. In the last few years, it seems like I’m always dealing with something. He’s a little off because he tweaked an ankle. A week and a half ago, he scalped his foot. He’s getting more and more prone to White Line Disease. Last night, I opened his stall door to find this. None of these are really new problems, or dire problems. So I picked out and treated his feet. I checked the scab on his heel. 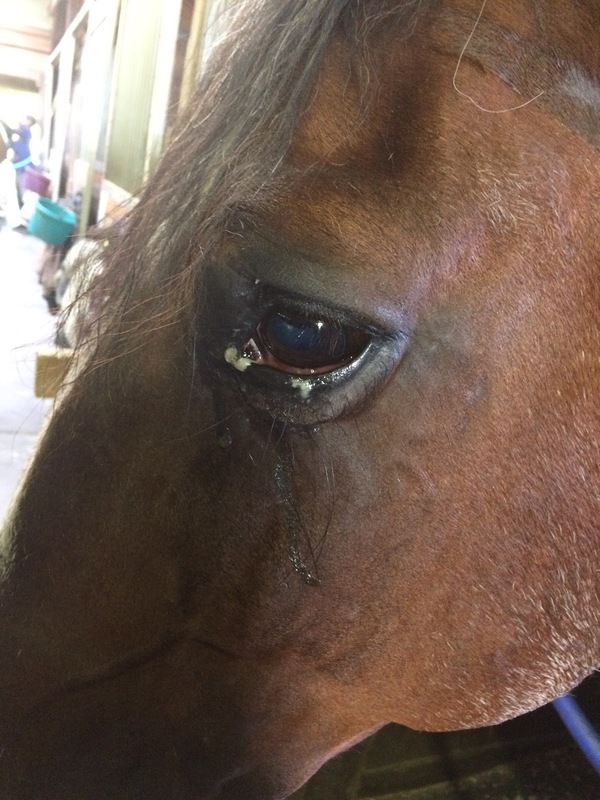 I flushed his eye with saline and treated it with his opthalmic antibiotics. Every day, it’s something. Some of this is his Cushings, making his overall immune system more susceptible to all these little things. A lot of it is age. I was wondering, last night, as I drove home: is this the emotional burden of older horses that no one talks about? I know that there are young horses who do stupid things to themselves on the regular, but it always feels different to me. Is this the slow unraveling, the wearing down of your heart, the thousand tiny pricks so that you grow used to the idea of physical challenges involving your horse? I should clarify: none of his problems are bad, and they are all a long way from his heart. He is overall a really healthy horse. But last night, finding that eye, it just felt like the slow drips of water wearing down our more carefree days. I still can’t imagine a life without Tristan, but I am beginning to feel, maybe a little bit, how the preparation of many smaller problems wears you down, helps you deal in tiny small ways with sadness, so that when the ultimate moment comes, it might hurt a little less. I don't have much to offer besides sympathy that it's stressful, but I am going to firmly second your eye warning to others. I would like to say it helps, and maybe it does. But it does and it doesn't. There is always love, and love, and grief (small griefs, the grief, it is all loss and pain) and more love. This is a wonderful post, and I can definitely relate (thought my two haven't had any extra vet calls…yet). It sounds plausible to me. When we lost one of the Haffies unexpectedly this spring, it was a complete shock because he'd always been the healthy one. We'd been bracing for bad news with the more fragile, slightly older Haffy; to have it hit the 'wrong' horse was a tough blow, and I think it would have been easier in some ways if we'd been consciously preparing for the possibility. Shortly after his 17th birthday, my horse had his first-ever bout of colic (in the nine years I'd known him, at least). It feels like every month or so, there's some new shitshow to deal with, but I refuse to accept this as the new normal. I know that we'll get back on solid ground. It might take a little more to get there, but I can't mentally accept that we're approaching retirement or worse. Also, Is this the slow unraveling, the wearing down of your heart, the thousand tiny pricks so that you grow used to the idea of physical challenges involving your horse? is one of the best articulated sentences of the feeling. I agree with everyone. “the wearing down of your heart, the thousand tiny pricks so that you grow used to the idea of physical challenges involving your horse?” hit me so hard.